Schofield, W.B. 1992. Some Common Mosses of British Columbia, 2nd ed. Royal British Columbia Museum, Victoria, British Columbia. Paperback, 394 pages. Some Common Mosses of British Columbia , written by an internationally recognized bryologist, is also accessible to the amateur. This is an excellent field guide with extensive keys to the species based on characteristics observable with a hand lens. This manual, which is usable in an area considerably larger than the target region, contains detailed distribution maps for British Columbia and verbal descriptions of world wide distribution. Names, name derivations, habitat descriptions, distiguishing features and full page illustrations are given for 126 species. Each species is illustrated with clear line drawings (no photos) of the plant's habit, leaves, and sporophyte. Introductory material explaining structure, life cycle, ecology, collecting methods, history of collectors, habitats etc is presented in a clear and authoritative manner. 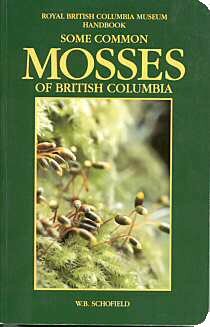 Some Common Mosses of British Columbia is a "must have" book for anyone interested in mosses. Serious amateurs and students of bryology should also consult Schofield's Introduction to Bryology (1985), the standard textbook in the field, also notable for its readabilty and accuracy.